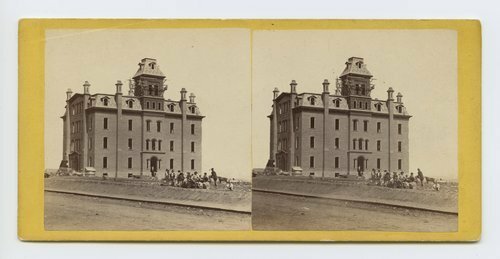 This stereograph shows the public school during construction, Leavenworth, Kan. There are people posed in front of the school building. It is from Alexander Gardner's series, Across the Continent on the Union Pacific Railway, Eastern Division. Public school, Leavenworth, Kansas. 309 miles west of St. Louis, Mo.